The Russian TV series ‘Rodina’ is based on the Israeli original Hatufilm, the American version of which is more famously known as ‘Homeland’. ‘Rodina’ is expected to premiere on the Rossiya 1 channel this fall. It will consist of 12 episodes and just one season for the time being. 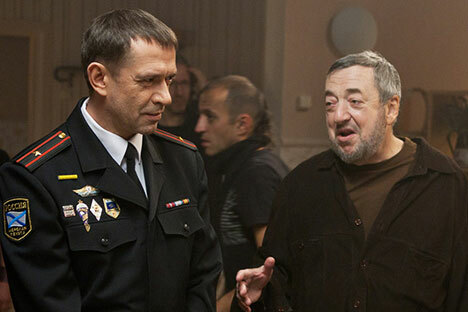 Director and scriptwriter Pavel Lungin discussed how the adaption will play out. Rossiyskaya Gazeta: As soon as you announced that you would be filming an adaption of the series, Rodina, there was immediate criticism. They said, for example, that such a show could never succeed on Russian soil. Pavel Lungin: I think that it will succeed. But it is, of course, a bit of a challenge because Homeland is a product of the new generation, and of a different level. Currently, in the U.S, they've started to get into a new type of TV show which has incorporated a lot from feature films: psychology, certain aesthetics. And most important of all is their discovery that TV shows are a kind of narcotic spectacle. You watch and you can't tear yourself away. After watching one episode you just want to keep going further, further, and further. Rodina is definitely one of those shows. In the U.S, more masters are now making TV shows. Martin Scorsese, Gus Van Sant... And now Ridley Scott is going to. This is no accident. The film genre has made a "loop." But that has all left again, and film has turned back once more to children's activities. A TV series, on the contrary, has become the bearer of psychology, analysis of the human soul, deep investigations... In this sense, it would seem this is the future of TV shows. R.G. : You said ‘the American series.’ But in the case of Rodina, did you use the Israeli formatand carry it directly over to Russian soil? P.L. : The Israeli series is a psychological story without a detective plot. There is no thriller element. It is a family story about how hard it is to return to normal life after six years of captivity. However, the American series combines the psychological theme with a brilliantly twisted, confusing plot where we don't fully understand who the protagonist is: a defector, a patriot, or not? How does he understand patriotism? What is captivity? What is insanity? The film touches on so many philosophical problems. And, for me, this is a necessary detective story, and not just a family story. R.G. : You said that you're filming for the new generation. They've seen the American version on the internet. Are you focusing on them? Or on the older generation, who have never seen this show? P.L. : Television, especially in our country, generally is made for the older generation. But a well-made product can have a large audience. A quickly made, cheap fakeis never a good thing. I want to make this a top-class series - then I hope that everyone will watch it. R.G. : Did you change the series a lot in order to take Russian realities into account? P.L. : The ‘skeleton’ was left intact because both shows were done just brilliantly. I could not have done better. But the muscles and meat built up on the skeleton definitely change the face. Despite the mechanics of the plot, this will be a purely Russian story that takes place in the 90s. R.G. : Will there be any foreign actors in the film? Your second director, Tomas Toth, is Hungarian. Perhapsyou've asked someone from Israel? Or from the U.S.? P.L. : We cast a great Romanian actor for the role of the main terrorist. ValeriuAndriuta. He played the main role – a priest – in Cristian Mungui's picture Over the Hills. His family is from Kishinev. He speaks Russian. We found the Arabs here in Russia, they live in Moscow. We have Count Orlov, who is actually Egyptian, playing in a minor role. His great-grandfather or grandfather married the daughter of an Egyptian king, and so they joined Russian and Egyptian blood. He lives in Switzerland and is a businessman. All kinds of things happen in Moscow. At the heart of the plot is a confrontation between an FSB expert analyst and a military officer who is experiencing post-traumatic stress disorder and is suspected of recruiting terrorists. The action takes placein 1993. Alexei Bragin (Vladimir Mashkov), a colonel in the Marines, and sniper Yuri Khamzin go missing during Russian military operationsin the North Caucasus. Six years later, during a special operation in the region, terrorist training camps are destroyed, and a bunker is captured - in which Bragin is found chained to the wall with an overgrown beard. The story of the colonel, who was presumed dead, becomes public. The freed Bragin is in grave psychological and physical condition, as he is exhausted from long years of torture and solitary confinement. Doctors and psychologists begin to work on Bragin, as well as Anna (ViktoriaIsakova), an expert analyst for the FSB’s Counterterrorism Center. The film also features Maria Mironova, Sergei Makovetsky, Alisa Khazanova, and others.